You can enter daily to win the Weber Jumbo Joe Charcoal Grill and Other Prizes Giveaway Sweepstakes, but this sweeps ends on August 28. If you would like to enter to win the Weber Jumbo Joe Charcoal Grill and Other Prizes Giveaway Sweepstakes, simply click here to fill out the request form. You must login to Facebook and “Like” their page to see the entry form. 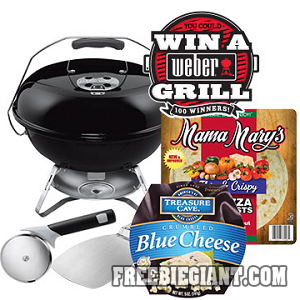 (100): Each Daily Winner will receive all of the following items: one (1) Weber® Jumbo Joe® charcoal grill, one (1) Weber® pizza paddle, one (1) Weber® pizza cutter, one (1) Treasure Cave® cheese coupon good for the purchase of one (1) Treasure Cave® cheese product valued up to $2.99, and one (1) Mama Mary’s™ Pizza Crust coupon good for the purchase of one (1) Mama Mary’s™ Pizza Crust product valued up to $4.49 (“Daily Prize”). The ARV of each Daily Prize is $128.45.